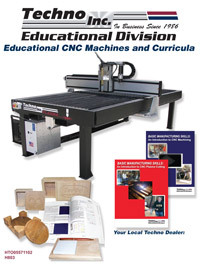 Techno’s newly revised 8-page educational brochure, Educational CNC Machines and Curricula, the H803, contains information on state-of-the-art CNC routers, CNC plasma cutters and CNC curricula designed for industry and affordable by education. Find specifications, dimensions and pricing easily. Supplementary to the H850, The Techno Book of CAD/CAM CNC, the H803 provides the most recent information on new and updated educational products for teachers and students to receive the most current CNC router and CNC plasma offerings. This exciting full-color brochure is guaranteed to generate interest and discussion! Editorial spreads of Techno’s CNC Plasma Cutter, Patriot CNC Router, LC Tabletop CNC Router, LC CNC Router, Davinci CNC Router and CNC Metal Lathe feature colorful photos, descriptions and applications along with technical specifications to help you select a machine for your educational programs. Read about Techno’s An Introduction to CNC Machining and An Introduction to Plasma Cutting that teaches students the basics of CNC machining and Mastercam software while creating real world projects. Instructors have the opportunity to customize the included tests to reflect their specific classroom strategies with example files provided to help demonstrate each of the activities outlined within the workbook. A workbook, an instructor’s resource CD and kit are available and an optional tool kit may be purchased for use with An Introduction to CNC Machining. Part numbers for both curricula are included for instructors to place their orders. Both of these curricula are available for free use in classrooms till June 30, 2012 just by registering at http://www.techedcnc.com/Education1/Manuals/NewUser.htm.